Find the best deals for La-Z-Boy Black Friday 2019. We will post the online and print ads here when they are available so that you don’t miss any of the price discounts and savings! Lazy Boy recliners are sold at other retailers as well as in the company’s own stores. La-Z-Boy stores were open extended hours on Thanksgiving Weekend from 9 AM to 9 PM from Friday through Monday. The Black Friday sale of La-Z-Boy stores ran 4 days from the Friday after Thanksgiving through Monday. In its last Black Friday ad (2016), La-Z-Boy offered 30% off everything plus no interest on La-Z-Boy credit card purchases of $2999 or more (after discount). It offered your choice from 3 great recliner styles (conner, Jasper, Gabe) and 30+ fabrics for $388 each. The Easton, Rowan and Raleigh High Leg Recliners were sold at a savings of $311 for $488 each. 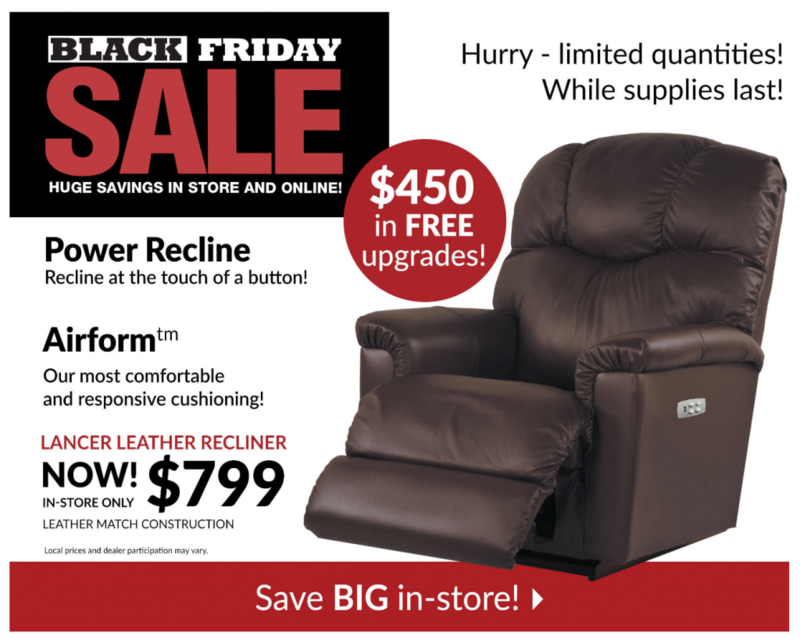 Its hot buy recliner was the James Leather Recliner for $688 (originally $1199). Its 2016 sofa deals included the Dolce premier Stationary sofa or the Hayes reclining sofa for $788 each (savings of $611). Other sofas were made available for $888 ($611 off), $988 ($611 off), $1488 (originally $2499), $1588 (originally $2499) and the Sheldon 3 piece reclining sectional sofa for $1988 (originally $3299). La-Z-Boy is a furniture manufacturer based in Michigan that sells furniture via thousands of retail outlets. It is known for its recliners and motion furniture. Other items it sells include sofas, loveseats, chairs, ottomans, sleeper sofas, tables, chairs, dressers, entertainment centers and other wood furniture.